(125ml) lemon juice Archives - Adelaide Central Market: The City of Adelaide's premier food destination. Over 70 traders under one roof. For the dressing, combine garlic, chilli, juice, oil, parsley, salt and pepper together in a medium sized screw top jar. Seal lid firmly, before shaking vigorously to combine. 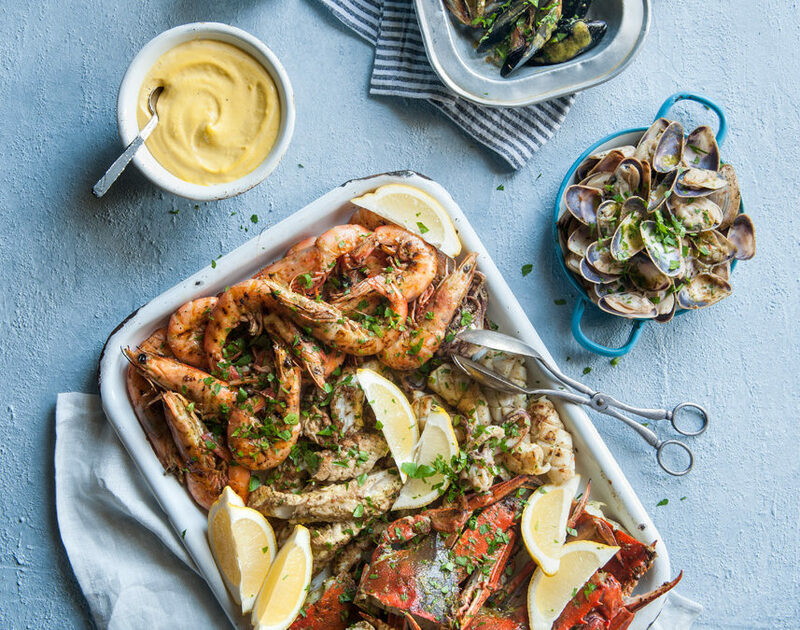 Place the prepared seafood in individual bowls and evenly divide half the dressing between the bowls, tossing gently to combine. Cover each bowl with plastic wrap and refrigerate for 30 minutes, to allow seafood to marinate. For the aioli, place lemon juice and saffron together in a small bowl and leave to stand for 5 minutes. Meanwhile, place yolks, mustard, roasted garlic, salt and pepper together in a small food processor and pulse to combine. With the motor going, slowly add oils until mixture becomes thick. Slowly add lemon juice and saffron, blending until combined. Spoon into a serving bowl and set aside until required. Place crab onto the grill or grill plate and cook for 5 minutes each side, or until cooked through. Remove from heat quickly to avoid overcooking and place on a serving platter, cover in foil to keep warm. Repeat step 5 with prawns for 2 minutes each side or until cooked through. Repeat step 5 with mussels for 2-3 minutes or until mussels start opening. Repeat step 5 with marinated squid, pipi’s and fish fillets for 1-2 minutes or until opaque or pipis start opening. 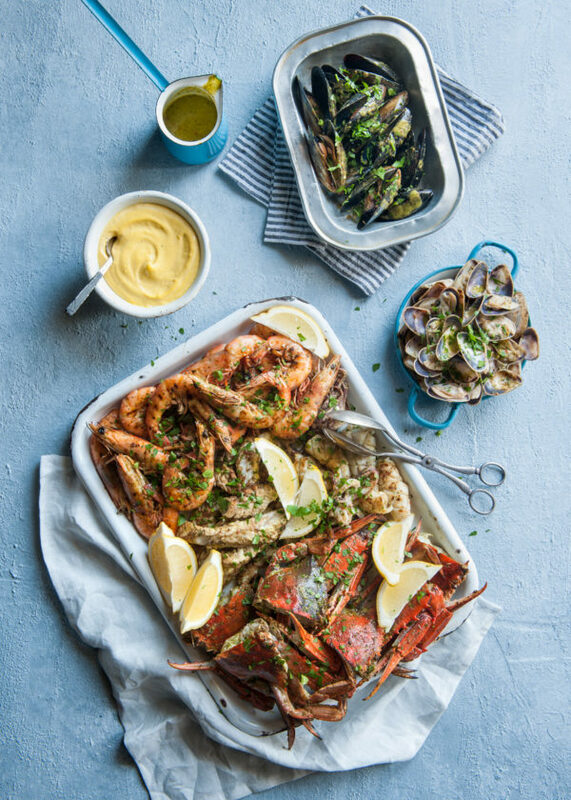 To serve seafood platter, drizzle remaining dressing over the barbecued seafood and serve with lemon and saffron aioli and lemon wedges.